Funeral Blues draws on the text of what is now one of W.H. Auden’s best-known poems. ‘Stop all the clocks, cut off the telephone, Prevent the dog from barking with a juicy bone’ is the opening couplet, and was used in the 1994 film Four Weddings and a Funeral. Initially the setting was used in the incidental music for The Ascent of F6, but Britten extracted it and set it for voice (preferably soprano) and piano. Paul Kildea discusses a preoccupation that Britten had with funeral marches around this time, noting a number of examples in Britten compositions during the late 1930s. 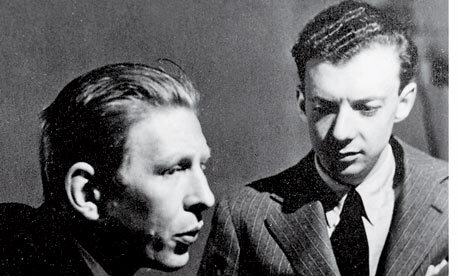 He suggests the reason is Britten’s pacifism and awareness of the Spanish Civil War, in which Auden chose to contribute as an ambulance driver, not to mention events building up to the Second World War. However my personal feeling is that the answer is closer to home, and that the composer was still reeling from the shock of the tragic death of his mother. That – and a preoccupation with the music of Mahler – would surely have counted for much. Funeral Blues, though, is a highly regarded utterance that is often grouped with the three other surviving cabaret songs that were finally published in 1980. It appears ever more regularly in recitals as an example of Britten at his most obviously expressive. Funeral Blues begins as a sombre but intense song with an air of tension finally released in the tumult of the final verse. Auden’s text is so powerful that a lesser composer could have floundered in setting it, but Britten steps up to the task. His less is more approach to the piano part – with added note harmonies that move us imperceptibly towards the cabaret – works extremely well, because all the attention goes on to the singer and the text – and in the right performance that is all that matters. That said, there are some fiendish pyrotechnics from the piano at the end, as if the instrument has no option but to join the emotional outburst. Again, Della Jones excels in this repertoire, and the serious tone of her interpretation confirms this is the one to have, not to mention the belting fortissimo she achieves towards the close. This entry was posted in English, Listening to Britten, Songs, Uncategorized and tagged Benjamin Britten, cabaret, Four Weddings and a Funeral, The Ascent of F6, W.H. Auden. Bookmark the permalink.